It's monthly favourites time again - where did March go? - and in April I had an endless amount of love for products both old and rediscovered through 'shopping my stash' and brand spanking new. I've got quite a few picks this month, so let's get down to it. Starting with skincare and a little orange bottle of magic, the Pai Rosehip BioRegenerate Oil (£20) is a firm staple in my routine - every beauty blogger and YouTuber that I follow has and loves this, I'm yet to hear a bad word about it and I only have good things to say, too. I mentioned it in The Fortnightly One #2 and how I use it to wake up with baby soft, plump skin, which is two drops in my night cream before bed. The main issues I have with my skin are breakouts and dryness, and this nifty oil delivers on both accounts with high levels of Vitamin A to combat pesky acne scarring and an ultra healing formula to calm eczema. My current cleanser of choice is the Emma Hardie Amazing Face Moringa Cleansing Balm (£36) which frankly, is to die for. Hands down the best cleanser I've ever used, it leaves my skin so smooth, supple, perfectly clean and a million miles away from tight and stripped. An absolute dream for facial massage, it feels so nourishing and can also be used as a soothing, hydrating mask. My only gripe is the packaging - yes, it's gorgeous, but it isn't as expensive as it looks. I travelled with my tub and it cracked, causing the lid to break (which now doesn't screw on properly) and the base to separate from the pot - not ideal when you're paying that much money for 100ml of product! Moving onto makeup, I've been a little dissatisfied in the cosmetics department recently and felt like I needed an overhaul. Due to the disabling chronic illness that renders me mostly housebound and unable to work, I haven't had the pleasure of splurging my hard earned cash at the NARS and Dior counters for a long, long time - cue my first attempt at 'shopping my stash' à la Laura (aka Buy Now, Blog Later). Kicking things off with MAC, I rediscovered the Cream Colour Base in 'Pearl' (£15) which delivers the prettiest highlight on fair skin since Bourjois' Little Round Pot in 'Blanc Diaphane' (£6.99). I've hit pan on 'Pearl' so I must pick up another - I seem to have lost my 'Virgin Isle' CCB which was the most stunning coral, so that's added to my 'must repurchase' list also. I stumbled across a bevy of Barbie-pinks courtesy of my early high school years - we're talking 'Saint Germain' (who remembers that little number), 'Snob' and the Lady Gaga Viva Glam lippy (all £15). They're a little too pale and let's face it, '14-year-old-Meg' for me now, but I'm on a mission to find a way to make them work. Perhaps dabbed over a darker pink lipliner? During my stash-shopping I also found my long-lost Tweezerman Classic Lash Curler, discarded in a drawer after many failed attempts at Bambi-esque eyes. I've got a bit of a love/hate relationship with eyelash curlers - I've tried to like them and employed every technique in the book, but I never manage to grasp every lash and once I've applied my mascara I'm left with bent, wonky-looking peepers. However, I've discovered that if I'm skipping the lashings of mascara on an au naturale day then these babies make all the difference as with minimal effort, I go from sleepy to wide-eyed in a matter of seconds. And with a fatigue related illness? That's called hitting the jackpot, my friends. I've always been extremely fuss-free when it comes to my hair; I've never owned a pair of straighteners, rarely pick up my hairdryer and am very much a wash-and-go gal. Very little effort goes into my barnet as it's naturally straight, but a couple of months ago I had a good six/seven inches chopped off and my hair went from waist length to just below my shoulders. Now, it's nice to have healthy ends and all but I feel my hair went from long and tousled to short and 'meh' - cue dissatisfaction and the need for a styling tool. 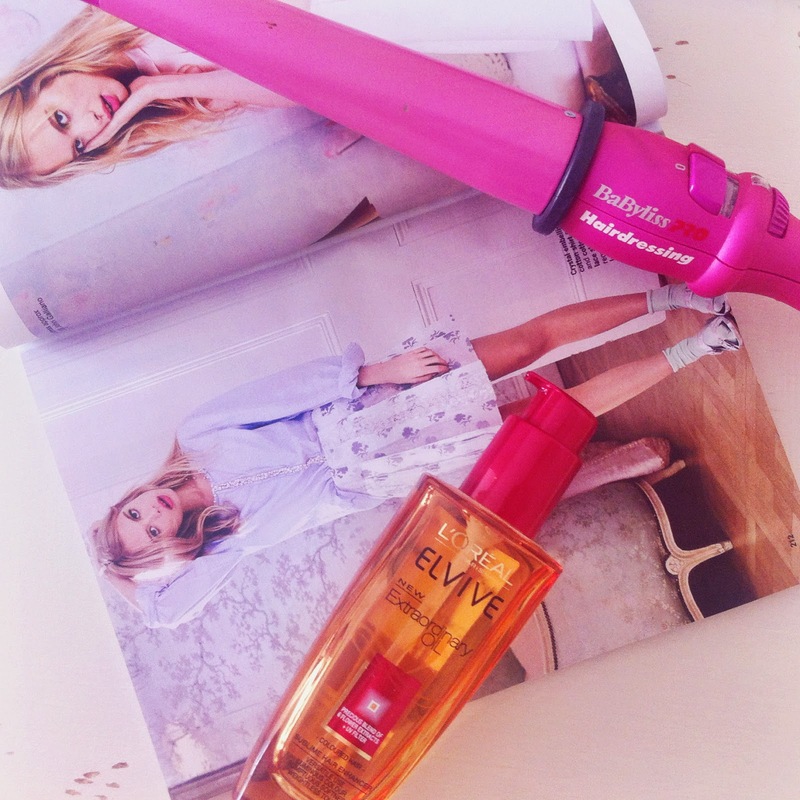 The BaByliss Pro Conical Wand (£26) has sat under my bed unloved for years, but after five minutes of use I was in love and gave it pride of place on my dressing table again. With no fiddly clamp to worry about I simply section my hair, curl the ends, brush through and voilà! Easy, soft waves that even I, someone who can't hold their arms above their head for ten seconds can achieve. Another product that was purchased on a whim and promptly forgotten about is the L'Oréal Elvive ExtraOrdinary Oil which I use post-curling to tame flyaways and add shine, but can also be used pre-styling as a heat protectant and before shampooing to protect colour. Versatile, prettily packaged and inexpensive, I'm a fan. P.S. April Favourites can mean only one thing... "it's gonna be May". I just had to. Lovely favorites Meg! I'm really in love with your beautiful lipstick colors. My latest treat is a new MAC lipstick, candy yum yum. Such a beautiful and pretty pink color. And you had a nice haircut, looks good on you! Hope May will be sweet to you!